For the month of February, the New Mexico Museum of Art in Santa Fe will be displaying an important book in the history of printing known as the First Folio. The First Folio was the first collected edition of Shakespeare’s plays, published in 1623, seven years after the author’s death. This special exhibition is just one of many planned throughout the world commemorating the 400th anniversary of Shakespeare’s death. Shakespeare’s plays have been the subject of countless works of art, and this subject will be explored further in a companion exhibition at the museum called Stage, Setting, Mood : Theatricality in the Visual Arts. The idea of an art museum celebrating the works of Shakespeare actually dates back to 1789, when a publisher named John Boydell opened the three room Shakespeare Gallery in London. The Shakespeare Gallery was enormously popular in its time. John Boydell commissioned the leading British artists of the day to paint scenes from Shakespeare’s plays. He then employed printmakers to make high quality reproductions of the paintings in the gallery which Boydell then published and sold. Stage, Setting, Mood includes four of Boydell’s color intalgio prints from the Shakespeare Gallery. On Friday, November 13, MW Chapter members from Santa Fe and Albuquerque, New Mexico, visited Santa Fe’s Museum Hill to tour two special libraries. First stop was the Bartlett Library and Archives at the Museum of International Folk Art, followed by lunch at the Museum Hill Cafe, and a tour of the Laboratory of Anthropology Library. There might have been a few stops at gift shops along the way… We talked artists files, special subject cataloguing, replacing offensive subject headings with inclusive ones, creating article analytics, and describing books in such detail the records become too large for MARC. If only we could do this every Friday! Many thanks to Joan Benedetti for the pictures. My personal award for best conference swag of all time goes to the 2015 ARLIS/NA Conference and the little pack of seeds for snap peas. This shot was taken in my garden about a week ago. 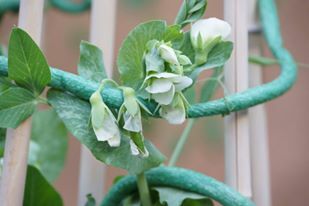 The first peas are ready to harvest now. Meanwhile, back at the Library, we are busy working on a possible digital asset collaboration grant (which explains why I’d rather rest my eyes on peas in our time). Regular, useful news will return next week. Apologies for the long silence on this blog. Here at the Museum of International Folk Art many of us wear multiple hats. I am both the Librarian and Archivist, and sometimes a one-woman moving crew. This May marked a wonderful transition, as our Archives finally graduated into its very own space. The process of finding space in an overcrowded facility, then finding funding for the compact shelving that would make the space useful, took a long while, but we got there in the end. The shelving selected is a Quadra Mobile system, a modular, moveable form of compact storage that is perfect for us, as there’s a chance the Archives will move again in a few years. Shelving was installed in early May, and for the past two weeks I’ve been moving in. I’m very grateful to our security staff who moved the large flat files and filing cabinet. The records themselves I had to move, in large part because they were coming from three different temporary storage areas, and collections had gotten split up over the years. It was necessary to go bit by bit, checking carefully against an inventory done this winter, to ensure collections went in place in an organized way. 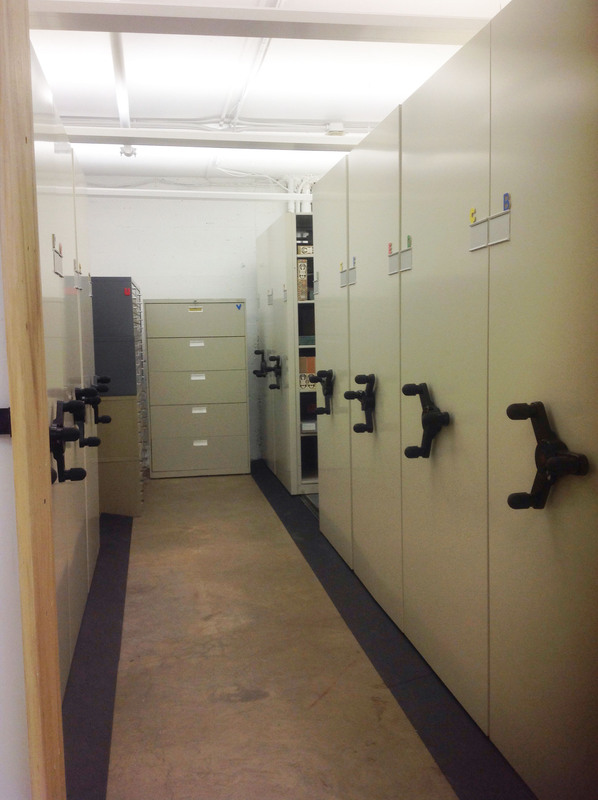 One of the spaces now emptied of archival material is the back room of our Library. It is well on its way to becoming a workroom and processing area, something we have not had at all. Processing has been done either in my office, or in the public space of the Library. Working in the public area meant our intrepid volunteers had to haul out all their supplies from my office, do their work, and then squirrel everything away again. Now we’ll be able to leave longer term projects staged and ready for work whenever a volunteer can come in. This arrangement also gave us a space for our “study collections,” collections of materials (images, postcards, recordings, books, and more) that are not archival in nature, but don’t really fit in a classic library arrangement either. 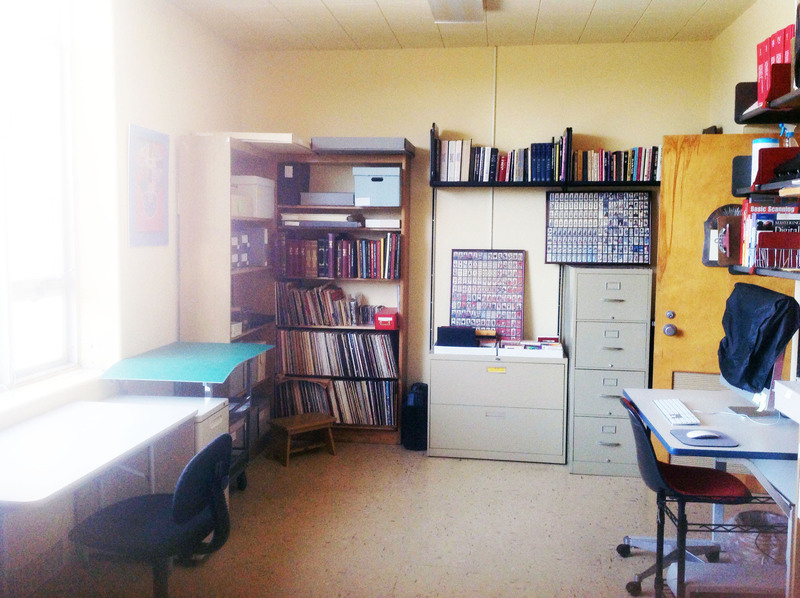 When not in use by library volunteers, the workroom will be a quiet space for our curators to do reading and research. They are looking forward to it. Their offices are downstairs, without windows or light, so this will be a welcome change. With a bit of new furniture, this room can also double – or wait, it’s triple by now, isn’t it? – as a small meeting room. The only meeting spaces we have are the break table downstairs, the main Library research tables, and a small table in the Director’s office. It’s not just the people here who wear many hats. The spaces have to multi-task as well. More regular blogging will resume now that I’ve hung up my mover’s cap and resumed librarianship. Thanks for your patience. I am happy to write today of my gratitude to the Mountain West Chapter. Thank you for choosing me to receive this year’s Winberta Yao Travel Award to attend the ARLIS/NA Conference in Fort Worth. I am looking forward to learning and sharing, and I promise to blog about my experiences as frequently I can for the sake of those who cannot attend in person, as I could not last year. After years of working in public libraries, I find I have to adjust my ideas of programming and outreach to work for a museum library and archives. I’m excited that this month, in addition to the tedium of inventory and the pleasure of researcher visits, the Bartlett Library and Archives of the Museum of International Folk Art has a couple of good new programs coming up. First is a group of teen and tween students coming to do library and archival research on works and artists in our current Gallery of Conscience exhibit Between Two Worlds. The Gallery of Conscience is one of the International Sites of Conscience . Between Two Worlds explores questions related to immigration, and the ideas of home, belonging, and place, through the lens of folk arts and the experiences and creations of folk artists. I am looking forward to working with these students. Next up is a teacher in-service related to the permanent exhibit Multiple Visions, and its creator/designer/collector, Alexander Girard. The Museum’s Education staff puts together a wonderful in-service each year, but this is the first year in which the Library and Archives has been invited to participate. We are pulling together several elements from the Girard archive collection and using them to talk about differences between libraries and archives, the role of archives in a museum, and how much one can learn from examining not just the content of an archival collection, but the unique way the originator of that collection (in this case, Girard) chose to organize information. When I arrived my position had been vacant for a long while, and I felt the library had been sadly marginalized because of that. It is great to feel it becoming part of the whole life and fabric of the museum again. Last Friday ARLIS/NA-MW librarians from Santa Fe and Albuquerque, New Mexico met for luncheon and a tour of the University of New Mexico Art Museum. Over fish tacos and assorted other plates slathered with delicious chile, we talked about the best ways to keep in touch (newsletters, blogs, social media…), the work we are doing, and plans for a spring meeting to discuss artists’ files. Big news of the week was the very successful sale of paintings from the O’Keeffe Museum. Funds from the auction will support new acquisitions.